Welcome to the Academic Excellence section of our new website. Throughout the school year, this is where you will find lists for student honor and merit rolls, Citizens of the Month, scholarship information and other academic-related news and items. On the right side, you can find a link to learn more about curriculum in the district, as well as other information. Every month, Newark City Schools honors about 28 students from grades 4 through 12 in every school as our Citizens of the Month. Students are chosen for what they do both inside and outside of the classroom. Also every month, a different group from one of our schools performs for students and their families. This month, the Ben Franklin Elementary Chorale performed for the families. Thank you to the Newark Kiwanis Club for sponsoring this month's lunch. Congratulations to the January 2017 Citizens of the Month. Find a Facebook photo gallery of the afternoon here. Every month, Newark City Schools honors 28 students from grades 4 through 12 in every school as our Citizens of the Month. Students are chosen for what they do both inside and outside of the classroom. Also every month, a different group from one of our schools performs for students and their families. This month, the Newark High School Swing Choir performed. 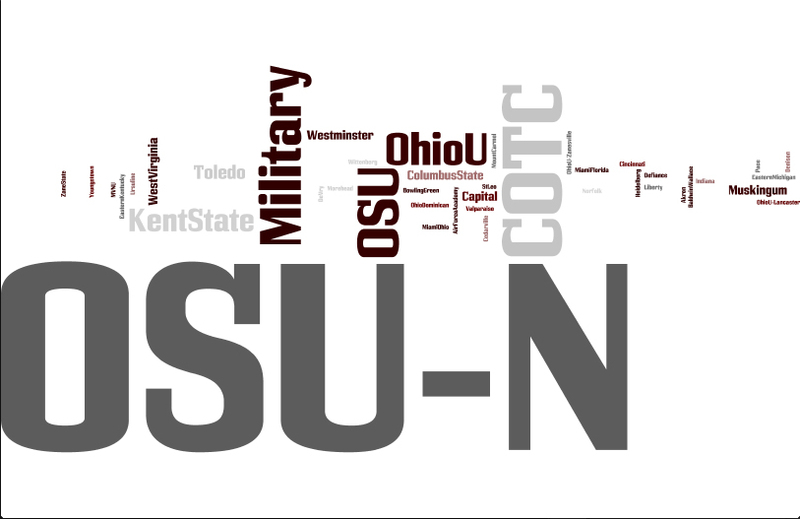 Where is the Class of 2016 headed? Every month, Newark City Schools honors 28 students from grades 4 through 12 in every school as our Citizens of the Month. Students are chosen for what they do both inside and outside of the classroom. Also every month, a different group from one of our schools performs for students and their families. This month, the John Clem Elementary Chorale performed improv comedy for the families. Thank you to 1st Response and Bill Mitchell for sponsoring this month's lunch. Congratulations to the March 2016 Citizens of the Month. You can find a Facebook photo gallery at this link. Superintendent Doug Ute delivered a presentation to the Newark Board of Education during the February regular meeting. This presentation outlined some current and future district initiatives both in- and outside the classroom. You can watch the full board meeting here on YouTube, or listen to Mr. Ute's presentation below. You can now download the graduation program for the Class of 2015. Download the cover at this link, and the full program here. Where is the Class of 2015 headed? In this episode, hear from 2015 Leaders for Learning Award recipients NHS teacher Juli Porter, Wilson Middle School teacher Shellie Herrmann, and elementary math coach Rachel Fielhauer. You can download the podcast by right-clicking this link, or subscribe to the podcast on iTunes. You can also find the podcast on SoundCloud or listen below. Congratulations to the following three teachers for being named Leaders for Learning in 2015: Newark High School French teacher Juli Porter; Wilson Middle School Language Arts teacher Shellie Herrmann; and elementary math coach Rachel Fielhauer. The week of Feb. 9 was Random Acts of Kindness Week at Newark High School, led by the Friends of Rachel Club. For this episode of the Newark City Schools podcast, hear from student leaders Lydia King, Drayton Santavicca and Ian Murphy, as well as guidance counselor Scott Koebel. You can stream the podcast below through SoundCloud, subscribe on iTunes and find our full podcast page here. 10TV covered the story; click here. The Advocate also covered the story, here. Congratulations to all students on the Principal's List, Honor and Merit Rolls from the 1st quarter of the 2014-15 school year from Liberty Middle School. Click on "Read More" to see the full list. Newark High School inducted its new National Honor Society members on Tuesday, Oct. 21, and invited them to a special breakfast the following morning. 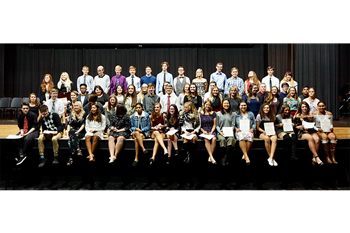 Congratulations to all National Honor Society members. View a Facebook Photo Gallery here. In the 11th episode of the Newark City Schools Podcast, learn about the district's new Lego Robotics programs at our middle schools. Visit our district Facebook page (Facebook.com/NewarkCitySchools) to see a photo gallery of one of the programs. Download the podcast here, listen on SoundCloud, subscribe on iTunes or stream below. Where is the Class of 2014 going next?